KLH-conjugated synthetic peptide selected from the N terminal region of human SMURF1 within aa 1~100. 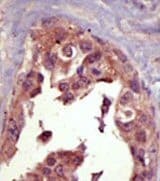 Mouse kidney tissue lysate, human breast carcinoma tissue. Our Abpromise guarantee covers the use of ab38866 in the following tested applications. WB 1/100 - 1/500. Detects a band of approximately 86 kDa (predicted molecular weight: 86 kDa). E3 ubiquitin-protein ligase that acts as a negative regulator of BMP signaling pathway. Acts by mediating ubiquitination and degradation of SMAD1 and SMAD5, 2 receptor-regulated SMADs specific for the BMP pathway. Promotes ubiquitination and subsequent proteasomal degradation of TRAF family members. Ubiquitinated by the SCF(FBXL15) complex at Lys-381 and Lys-383, leading to its degradation by the proteasome. Lys-383 is the primary ubiquitination site. ab22983 at a 1/50 dilution, staining human breast carcinoma by immunohistochemistry by formalin-fixed and paraffin-embedded tissue, followed by AEC staining. Publishing research using ab38866? Please let us know so that we can cite the reference in this datasheet. 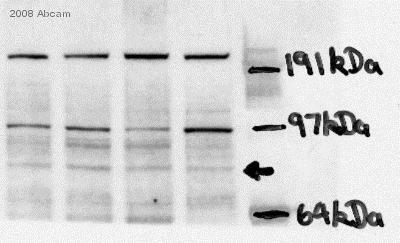 I would like to test this antibody in WB & zebrafish. I have issued 2 discount codes as part of our "100% testing discount offer". To redeem this offer, please submit your Abreview with the Zebrafish data and include these codes in the "Additional Comments" section so that we will know the Abreview is for this promotion. The code will be active once the Abreview has been submitted and you will be eligible for a 100% discount on the following purchase. Any feedback that you can provide will be greatly appreciated, and I hope the products work well.